The former police chief of the Mexican city where 43 students disappeared in 2014 has been detained after two years on the run, officials say. Felipe Flores was arrested in Iguala, in the southern state of Guerrero, where the incident happened. The government says the students were arrested by police before being handed over to a drugs cartel who killed them and incinerated their bodies. But families and independent experts contest this claim. The panel of experts, working for the Inter-American Commission on Human Rights, said the account that the students had been burnt beyond identification at a rubbish dump was physically impossible. Felipe Flores was police chief of Iguala when the incident took place on 26 September 2014, and his arrest may offer new clues as to what exactly happened then. Attorney General Arely Gomez welcomed Felipe Flores' capture, writing on Twitter that it would allow investigators to get "a fundamental statement to clear up the events". The case has tainted President Enrique Pena Nieto's image. The 43 were all students at an all-male teacher training college in the town of Aytozinapa, in south-western Guerrero state. The college has a history of left-wing activism and the students regularly took part in protests. 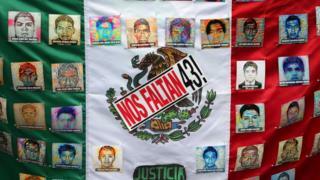 They disappeared from the nearby town of Iguala on the evening of 26 September 2014 after a confrontation between municipal police and the students during which six people were killed. Have any of them been found? Independent forensic experts have matched charred bone fragments reportedly found at a rubbish dump near Iguala to Alexander Mora, one of the 43 missing students. They also say there is a high probability another set of remains could belong to Jhosivani Guerrero de la Cruz, another of the students. However, experts from the Inter-American Commission of Human Rights say the chain of evidence was broken and they could not be sure the bone fragments had been found at the dump. What is the government's version of events? According to the official report, the students were seized by corrupt municipal police officers who handed them over to members of a local drugs gang. The drugs gang mistook the students for members of a rival gang, killed them and burned their bodies at the dump before throwing their ashes into a nearby stream. Why do the families not believe the official report? They think officials have failed to investigate the role soldiers from a nearby barracks may have played in the students' disappearance. The government has refused to let the soldiers, who were in the area at the time of the disappearance, be questioned by anyone but government prosecutors. The families also point to the report by the Inter-American Commission on Human Rights which said that there was no evidence the bodies of the 43 were burned at the dump.